The elegant design and outstanding performance made the Forte a standout among its competitors. We specialize in well-cared for, previously used gear because that is what we are passionate about. We feel that there is nothing more fulfilling than creating a high-performance system on a budget with carefully selected used components, speakers and cables. Klipsch Forte III Speaker real-Walnut-finish AUTHORIZED-DEALER $2000 list ! The elegant design and outstanding performance made the Forte a standout among its competitors. We do, too. This gives each speaker a more aesthetically appealing and consistent appearance that is treasured more than any other cut of wood veneer. Vintage Klipsch Forte Speakers in very good condition sound fantastic, no smoking or pets home 2nd owner LOCAL PICKUP only . The elegant design and outstanding performance made the Forte a standout among its competitors. No detail goes unnoticed. This gives each speaker a more aesthetically appealing and consistent appearance that is treasured more than any other cut of wood veneer. The elegant design and outstanding performance made the Forte a standout among its competitors. FORTE III Cherry. High efficiency, full range loudspeaker. 15" Passive Radiator for full range performance. And they will also work on Forte III, Heresy III, Cornwall III, KPT-200 speakers. 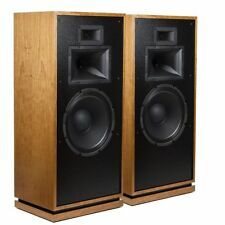 Klipsch Forte III Heritage Distressed-Oak Speaker AUTHORIZED-DEALER $2000-list ! Quartet,Heresy II, Forte, Forte II, Chorus, Chorus II, KG. These include the following tweeters They will fit. This gives each speaker a more aesthetically appealing and consistent appearance that is treasured more than any other cut of wood veneer. No detail goes unnoticed. The Forte III hosts a three–way design utilizing a 12” woofer and horn–loaded midrange and tweeter. Sounds real good.DCR reads 10.9 and 11.1 OHMS. Klipsch Forte III 15" Loudspeaker Pair Textured Black B-stock Made in USA! The elegant design and outstanding performance made the Forte a standout among its competitors. There were minor imperfections in the veneer, so the factory sprayed the cabinets with black textured paint. The Picture is the picture of the actual item. It is a beautiful piece of Audio History. ---Single Page, Single Sided Ads, unless otherwise noted in the title. This is a reprint of an Audio Review from 1994! Very rare and hard to find! A piece of Audio History! -Page is 8.5" by 11". The elegant design and outstanding performance made the Forte a standout among its competitors. This gives each speaker a more aesthetically appealing and consistent appearance that is treasured more than any other cut of wood veneer. Klipsch Forte Speaker Review,1985, 2 pages, II, HORNS! This is a reprint of the Stereo Review test done in 1985. You will not be dissapointed by this review. Pink Triangle Ordinal. Mission 751 loudspeaker. Up for sale is the February 1994 of the British audio magazine "Hi-Fi News & Record Review". This 114-page issue is in good condition. Marantz PM54 SE amp. The elegant design and outstanding performance made the Forte a standout among its competitors. FORTE III WALNUT. High efficiency, full range loudspeaker. 15" Passive Radiator for full range performance.